Our Firefighting Tools, Special Unit Tools and General Tools from Emergency Responder Products are toughest tools in the industry. We know the abuse you give them and they can take it! 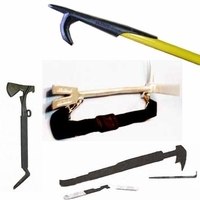 We carry Pike Poles, Trash Hooks, Sheet Rock Hooks, Hook System poles, Halligan type tools, Elevator Keys, K-Tools, Axes, roof hooks, San Francisco Hooks and more hand tools.